click on our Etsy link below. ​to illuminate the image. Each film cell is unique since each cell only appears 1/24th of a second when projected. This is truly a one of a kind item. The film cells used to create the Actual Film Votive are from random reels of film that have been rescued from being thrown in the trash. You'd be surprised what gets thrown out as movie theaters make the transition from film to digital. All of these iconic images from old Hollywood already exist in a national archive and have made the journey from the original 35mm film to the digital world of disc and hard drive media. - one candle at a time. Here is a chance to own a piece of actual film. A hand crafted one of a kind film cell from a bygone era that once had its run in an old movie house. 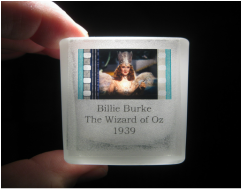 Our Actual Film Votive can turn your mantle, shelf or office into a mini museum for any film enthusiast or friend to admire. We're 3 projectionists who work in NYC and over the years have become unwitting collectors, because we didn't have the heart to see film thrown out. This past year we decided to make our Christmas gifts. We took a film cell from an old movie and embedded it onto a candle votive. Friends and family went nuts! We used a real 35mm film cell that ran through a projector and showed on the silver screen. Some of these film cells are really quite valuable to a collector. But we are not interested in chasing down buyers through blogs. Too much time spent at the computer already. We wanted to find a new audience who would appreciate the value and novelty of owning a piece of old Hollywood. And we are having a ball putting these together. When you light the candle the flame sits right behind the Film Cell and gives it a new, unintended life and your own private screening. Film titles will change as stock is sold and acquired. Please goto our Etsy page for all inquiries and purchases.